Nothing is worse during the dark winter months than getting sick. A cold alone lasts for two weeks on average. Shorten the duration of your illness (or just feel a bit better faster) by following one of these suggestions. Not only does gargling with warm salt water help to ease a scratchy throat fast if you’re already sick; according to one New York Times blog, it can help stave off respiratory infections altogether. I think I’m going to add salt water gargling to my own daily regimen this winter to see for myself! Taking a hot shower when you’re feeling sick is an instant pick-me-up. Similar to a humidifier, a hot shower produces steam that can help relieve cold or respiratory symptoms. Not too mention how great it is to be enveloped in warmth for a few minutes during the coldest winter months. No, not alcohol (sorry! ); that would be counter-productive. Because your body becomes dehydrated more easily when you’re sick, it’s important to drink even more liquids than you normally do. Water, tea, lemon-lime soda, even dairy — as long as you’re staying hydrated; it’s all fair game. Who doesn’t love soup when they’re feeling sick? My personal must-have is tomato soup with a side of grilled cheese (delicious), but you might prefer a good chicken noodle. Or try this cranberry soup recipe for sick days (hint — cranberry beans can be substituted for more commonly found red kidney beans). You know that first real day when you think you’re coming down with a cold? Give yourself permission to take the next day off, and don’t use is at an excuse to try to get things done at home. One really good day of sleep and rest can help you to bounce back much more quickly than if you try to power through your cold. Your co-workers and friends will thank you, too. Exercise when you’re feeling sick seems counter-intuitive, but if you’re a regular exerciser anyway, getting off the couch and increasing blood flow can make you feel better in a hurry. How do you know if you’re too sick to do your normal routine? If your symptoms are primarily above the neck (as in, a sinus problem), you’re probably OK. If you’re having symptoms below the neck, however, it’s probably best to wait until those subside. Being stuck in cramped quarters with distant relatives for extended periods of time, project deadlines, grad school finals — all things that can raise your blood pressure toward the end of the year. Don’t let stress overwhelm you this year, though; instead, give these techniques a try. When you’re stressed, your breath becomes shallower, depriving your brain of oxygen it needs to think more clearly. If you’re feeling particularly stressed, take a few minutes to do some deep breathing exercises. Need some specific guidance on how to breath deeply? Try these breathing techniques. Like breathing, stretching increases blood flow. Start feeling less stressed right now with these easy yoga stretches you can do at your desk. If you don’t have a pet, try finding one. If you’re a student at George Mason University School of Law, a pet might even be supplied for you. During final exams this year, GMU Law provided puppies for a couple of hours once a week so anxious students can decompress. It’s not just GMU Law that has recognized the benefit of pet therapy, however; psychologists, veterinarians, and researchers have found beneficial effects from interacting with animals too. You know the feeling you get when one problem keeps nagging at you, and you can’t get that single idea out of your head? Try putting that thought down in writing — even clarifying what it is that’s bothering you, without thinking about a solution, can make you feel better. The old saying that laughter is the best medicine is really true. I have a fellow law student who, when the stress of finals threatens to overwhelm her, watches The Daily Show on her laptop in the library. Hearing her laugh actually eases my stress, too. Don’t dig The Daily Show? Take a break with a few of my other personal favorites: Awkward Family Photos, Funny or Die, and The Onion. If you’re stressed because you just can’t solve a complex problem or because you just can’t find the right words for your presentation at work, take a break. Psychologists have found that taking a short break from problems that puzzle you can actually help you solve them faster. This phenomenon, called the Incubation Effect, is based on the notion that learning can take place unconsciously. So do yourself a favor, and forget about your problems! 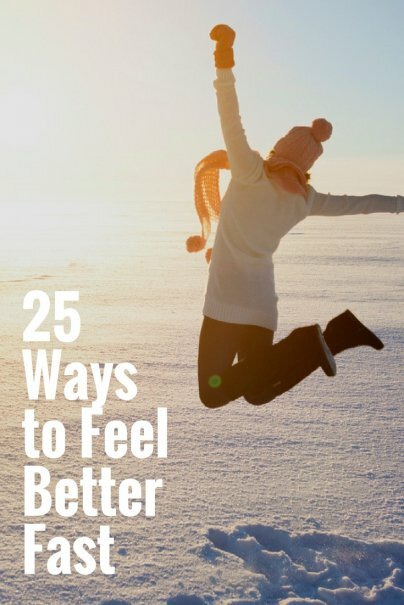 If you’re more prone to let anxiety and stress get you down, give yourself an instant lift by trying some of these mood-boosting moves. Taking five minutes to talk to someone you love when you’re feeling down can do wonders toward helping you feel better fast. Although complaining may only make you feel worse (and make your loved one feeling like a dumping ground for negativity), connecting with loved ones in general helps strengthen your social bond with that person, and research has shown that being sociable is good for your health. Sometimes, when it feels as if nothing is going your way, you can stem the tide of pessimism by stopping what you’re doing and indulging in something you don’t normally do. For me, that involves reading a good fashion mag. For you, that could mean soaking in a hot tub, watching an old movie, or treating yourself to some really good coffee. Injecting something that you know you love into your day can often do wonders for helping your overall perspective on things. You know that feeling you get when you help someone else? Warm and fuzzy. It also gives you perspective — maybe your own problems aren’t all that bad, in the grand scheme of things. It also gives you something else, as it turns out — better physical and mental health. So next time you’re feeling down, think about volunteering to turn your mood around fast. Like helping others, getting out in nature can help give perspective to your problems and help you feel better fast. And walking in the great outdoors has specific physical and mental health benefits that indoor exercise doesn’t appear to offer. The next time you’re feeling down, grab the hand of someone you love to feel better fast. Holding hands is an act of intimacy, which helps strengthen those social bonds we talked about in #13. It’s not all in your head, either — researchers have shown that the simple act of locking fingers has locking fingers has positive effects. No, I don’t mean that you should give up on your job, or your relationship, or whatever project you happen to be working on. If you’re feeling down because you can’t live up to some standard, however, try giving up the standard in order to feel better fast. Those who set unattainably high standards for themselves often set themselves up for failure and feelings of depression. So go ahead: give up your standard, forgive yourself for not living up to that standard, and re-adjust your thinking. I am a big proponent of the power nap to feel better quickly in the midst of a bad day. I like to think of it as “resetting” a bad day and turning it into a good one. Even a 15-20 snooze will do; science has shown that this amount of shut-eye has positive, mood-boosting effects. Few things can ruin a day like anger, but only if you let it. Turn your day around fast by using one of these guidelines. If you persistently suppress your anger (either because you dread confrontation or because you don’t think you should be getting angry), it can lead to one giant display of anger that leaves you regretful and others hurt. Instead, feel better fast by stopping and acknowledging your anger and defining where it came from, if possible. Even if you do nothing more, you’ll feel better. If you find yourself getting irate at a customer service rep who won’t let you return an item, feel better fast by thinking of another solution. Even though you might not be able to return the item, you may be able to ask for store credit, sell the item on eBay, or (if it makes you feel better), tell the store you won’t be shopping there again. Just getting angry without thinking of what would resolve your anger leads to more frustration, and nobody wins in the end. Does everybody else find those passive-aggressive workplace fridge messages as annoying as I do? “To whomever used my mayo yesterday — hope it made your sandwich tasty, because there was none left for me.” If you know who used your mayo, confront them politely and directly. The same goes for any other situation where your passive-aggressive behavior could be avoided with direct expression of anger. I promise, it will make you feel better much faster than you otherwise would. Feel better fast when you start to get angry by thinking about something else — something relaxing. Not only does it help to force yourself to stop thinking about what’s making you angry; it also helps to focus on something that calms you. After all, who could be angry when thinking about laying on a beach in Fiji? A lot of anger comes from judging others, which, as we all know, is a largely hypocritical activity. So next time you find yourself getting angry at your spouse for never picking up after himself, think about how your own shortcomings might be annoying or disappointing to him, too. We all have flaws, and getting angry at others for theirs won’t make them change. If someone seems to actually get pleasure out of making you angry (a bad boss, a frenemy, or just a generally ill-willed person), deprive them of the pleasure of seeing you get heated by…doing nothing. Not only will it stop you from doing something you’ll regret, but it will also signal to the other person that they can’t get a rise out of you. What methods do you use to feel better fast when you’re sick, stressed, depressed, or angry? Share your thoughts in the comments! I find that boxing class is especially helpful for eliminating anger, as well. It's a more constructive way to dish out my frustrations than, say, ramming into other drivers on the freeway (even though they totally deserve it). That sounds like SO much fun. I used to have a Wii, and when I did, I'd do a couple of bouts of Wii Sports boxing to destress when busy. It was great! You can kill two birds with one stone and knock out the annoying person laughing in a LIBRARY! I'm not really a writer, but this month I've started doing what I call brain dumps. Everyday or so I'll create a new Google Doc and jot down whatever is on my mind. Anything from business ideas to goals I want to accomplish. One might even call this journaling, but that doesn't sound very manly. Anyway, I've found it to be a great way to bring clarity to my thoughts and ideas. Plus, my brain no longer has to hold in all this information because it's written down. Excellent points. Drink a lot of water really helps. I drink a lot and try to stay calm in the when everyone is shouting. I tried everything and nothing worked. It's probably just me. Sometimes you are making yourself stay mad, stressed, etc. That's when you have to just let it all go and admit to yourself that you are the problem. This is easier said than done. But when you are sick this doesn't always work - over-the-counter medicines such as Ibuprofen or Tylenol generally help, as well as cold medicines. Hope this helps!